The third LC89 built, this example was entered in 12 Grands Prix during the 1989 season for drivers Alliot, Bernard and Alboreto. Its best results were an 11th for Bernard in France and for Alboreto in Portugal. 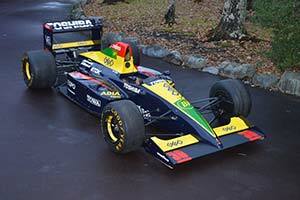 At the start of the 1990 season, it was also used twice by the team's new signing Aguri Suzuki, who retired on both occasions. Following its two outings in 1990, chassis 03 was retired from contemporary racing. It was then displayed in a museum for 28 years, during which time it received some work in 1993 and again in 2018. Still liveried in its 1990 colours, it was consigned to the 2019 Bonhams Goodwood Members' Meeting auction.